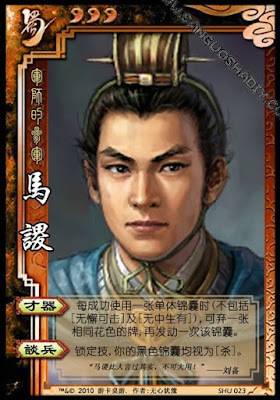 Whenever Ma Su successfully uses a single target non delay tool card, other than draw two and negate, he can discard any card of the same suit to use that same card again. All Ma Su's black tool cards are treated as attacks. Ma Su can only use "Sole Talent" after using the original tool card. "Text General" is not a choice. Ma Su can use all black tool cards as only an attack.